Who says beautiful mosaics can only be made of marble? Sometimes, bottle caps are all you need to create beauty. 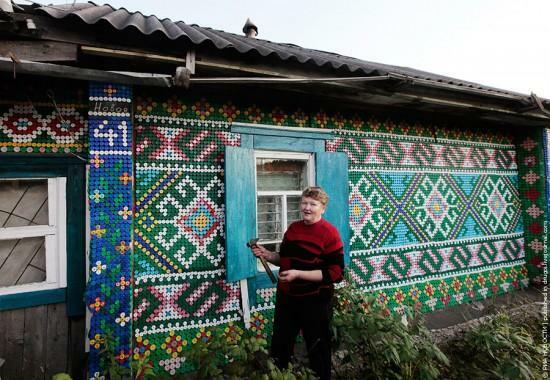 The live proof is Olga Kostina’s house, which she decorated with artistic patterns made from over 30,000 plastic bottle caps. The Russian pensioner from the lonely Russian village of Kamarchaga, in the Siberian taiga, found herself an artistic hobby to kill time. 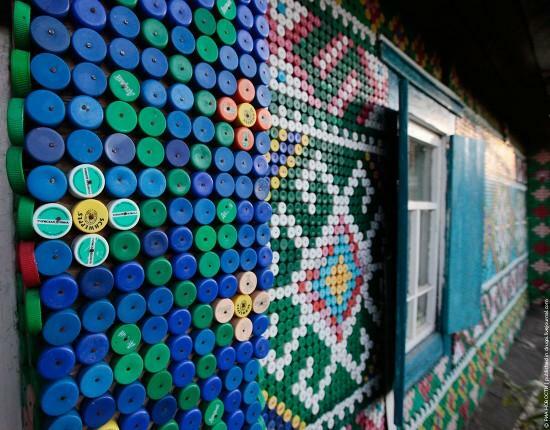 She had the brilliant idea of collecting bottle caps to decorate the walls of her simple wooden home. The beautiful pixelated patterns reflect traditional macrame and animal motifs, transforming the house into a remarkable landmark. The meticulous Russian pensioner used over 3,000 plastic bottle caps, placing each one by hand and fixing them with a hammer and nails to create the intricate mosaics.